The guide below shows you how to add a Form Report in five steps. Click on NEW FORM from the Forms section of your Hotjar admin. 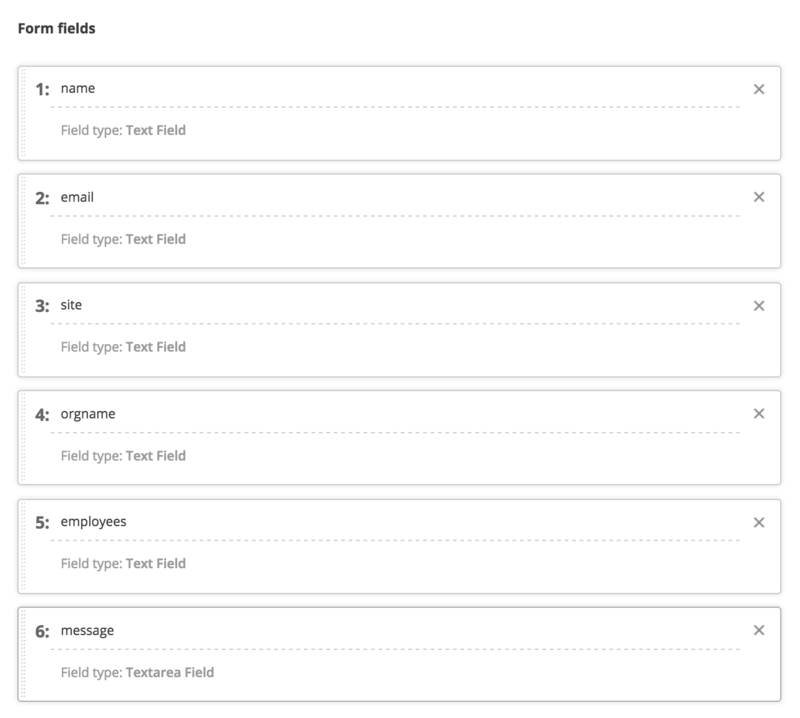 This will load the Form create page which will allow you to specify what Form you want to track. Hotjar Form Reports currently have a few limitations. For example, if the Form is on a page behind a login or is on a session-based page such as a checkout page, Hotjar cannot detect those. See our Forms Troubleshooting page for a short list of other limitations. 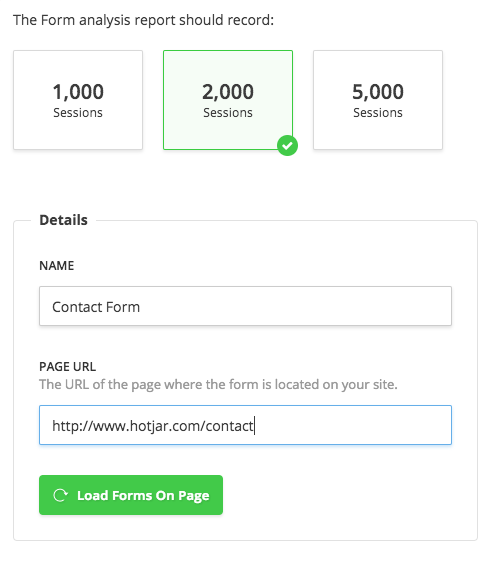 Snapshot size will determine how many sessions Hotjar will track your Form for before it considers the Form Report as complete. For more information, have a look at our "Snapshots" Explained article. Enter the name of your Form and the URL it is on. Click on Load Forms On Page as soon you've entered the URL your Form is on. If Hotjar is unable to load your Form, check our Troubleshooting article for more information on why this could be happening. Choose which Form you want to track. If your page has multiple Forms, you will need to select the Form you wish to track. 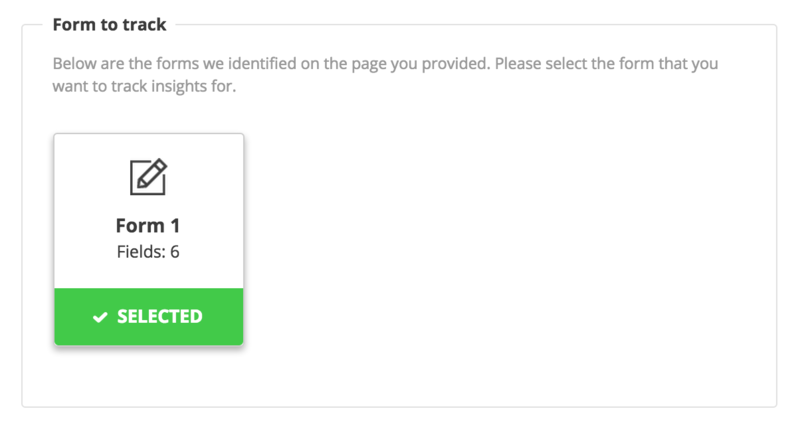 Currently, you can only track one form per page. Confirm which fields to track. At this point, you can also rename fields and re-order them. The way they are ordered now will determine how they appear in the Form Report later on. Once you add a Form to Hotjar, it will appear in your Forms list. The icon to the left of each Form shows you the status of each Form. 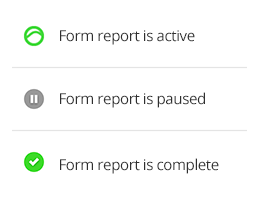 Once your Form Report is running and data is being collected, you can click View Report to see the full Form Report. To get a better understanding of what all the Form metrics mean, have a look at our Understanding the Form Report article. You will need to wait a few minutes before you start to see data. 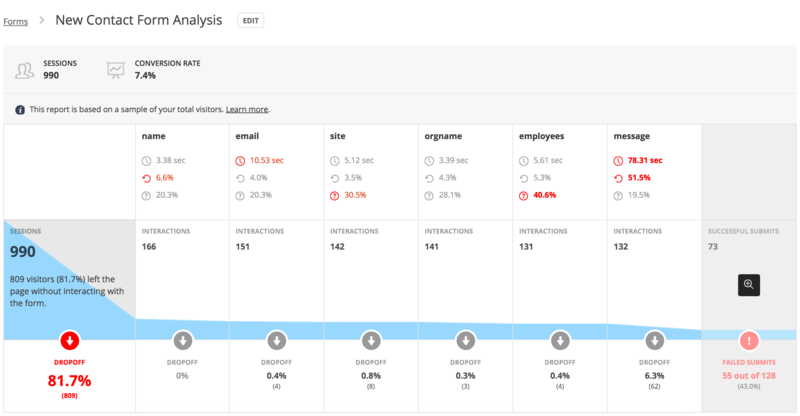 If you know for a fact that your Form Report should have tracked interactions/submissions but you are seeing no (or incomplete) data, check our Troubleshooting article for more information on why this could be happening.